Appearance: Saika is a tall, well figured young woman who stands 5'9" and only weighs 130. She has short, tappered dusty blonde hair that is usually tied into a spikey pony tail, and stuffed through the open back of her lucky hat. Usually seen wearing tangtops, shorts, and tennis shoes, she doesn't entirely care what she looks like to others. Her eyes a dark navy blue, almost to the point where they could be black. Her skin is slightly tanned and yet has very few blemishes or scars to it. Personality: In every sense of the word, Saika is nothing less then a tomboy. She's rough, tough, and not afraid to get her hands dirty if she has to. A fighter until the bitter end, but a fair loser in all, she'll throw every last thing she has at you until she's flat on her back. She's very strong for someone so tall and lean, both physically and emotionally. However, this by no means at all means that she is abusive toward her team mates. She loves them to death, and treats them as members of her own family. She believes that the way to earn a pokemons love and respect, is to love and respect them. Kind of like 'treat others as you wish to be treated'. Though she's open to all types, her favorite are Fighting type pokemon, and she dreams of someday becoming the greatest fighting type gym leader since Maylene. History: Originally from the Sinnoh region, Saika began her journey nearly seven years ago now, with her partner, Archer the Chimchar. Together, they began to sweep the Sinnoh region, taking gym after gym, and winning badge after badge. Their team grew, and they became more and more powerful as the weeks and months past. At last, the time came, for her to face the Elite Four. At first, the challenges were easy. The bug type expert Aaron fell with ease, then so did Bertha and her ground type team at the hands, or flowers, of Saika's Roserade, Lilac. And then soon came Flint, the fire type expert. It was a tough match, but in the end Saika came out with another victory under her belt. The same with Lucius, but then, as she came to the battle with Cynthia, her stride suddenly stopped. The loss devistated Saika, and she didn't even think of a rematch against Cynthia. She felt she wasn't good enough, that she let her team down, that she had let herself down. This depression like state continued for nearly three years, but then it turned into Saika becoming a hermit. She barely left the house and would simply mope in her room with her team at Proffesor Rowan's lab. As her seveteenth birthday past, her parents had had enough, and sent her to go and do something with her life. Saika wandered around for days, and eventually came to Veilstone City, where Maylene was the gym leader. She remembered that fight, and how she'd swept Maylene's team with Archer and Jasmine, her Staraptor. Sitting by the pokemon center, Saika was suddenly brought out of her thoughts as she saw a Lucario come around the corner. Then followed by the pink haired, bare foot fighting type gym leader, Maylene. Maylene looked over to Saika and was surprised to see her here. She began to talk to her, but didn't get much out of her. Just that she had taken on the league challenge, and lost at the very last second. Then Maylene told her something that puzzeled the ex-trainer. "A fighters spirit is always strong, what once was cannot be undone, embrace your failures, for that is how we learn, and soon enough you'll get another turn". At first, and for a very long time, this puzzled Saika, what did Maylene mean exactly? Then one day, she finaly understood. Going to Proffesor Rowan, she tried to get her team back so she could try to challenge the E4 again. But what Rowan had to say devistated the trainer, he said that her trainer card had expired, and techinically her pokemon weren't even hers anymore. And since she lost the championship, she couldn't renew it until she restarted her journey all over again. But then Rowan proposed another plan of action. Now, Saika heads toward the Honiso Region, hoping to gain the championship title here, and be able to reclaim her team as hers once again. Her troubles and woes have been left at ehr back, tossed into the wind like thousands of feathers. A new chance stands before her now, a chance at redemption. 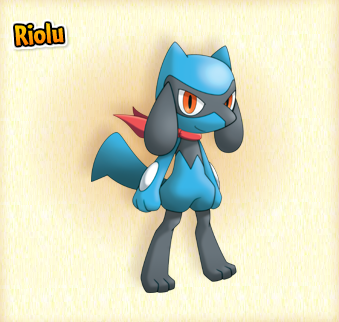 Personality: Julius is an Adamant Natured Riolu, who even though can be as stuborn as a Tarous, is very loyal and loving toward Saika. He'd lay his life on the line to keep her safe, without any second thoughts. This faith and devotion, came from the fact that Julius was the smallest of all the Riolu as Prof. Hawthorn's lab. He watched as his siblings and friends were picked instead of him. But once Saika picked him, Julius devoted himself to serving and protecting her since she had chossen him where everyone else had simply turned him away. Your character sheet seems in order, and it doesn't have as many grammar mistakes as many others I see. Welcome aboard. Now, although I can approve you, I unfortunately cannot change your user group.